A few weeks ago, we shared with you a concise chart featuring some of the best web tools and mobiles apps you can use with your students to create educational timelines. Today, we are adding another cool resource to this chart. Timeline Maker is a web-based tool from SoftSchools students can use in class to create printable timelines. The tool is very easy and does not require any software installation. Unless you want to save an electronic copy of your timeline in which case you need to register, otherwise you can create a timeline and print it right away without registering. 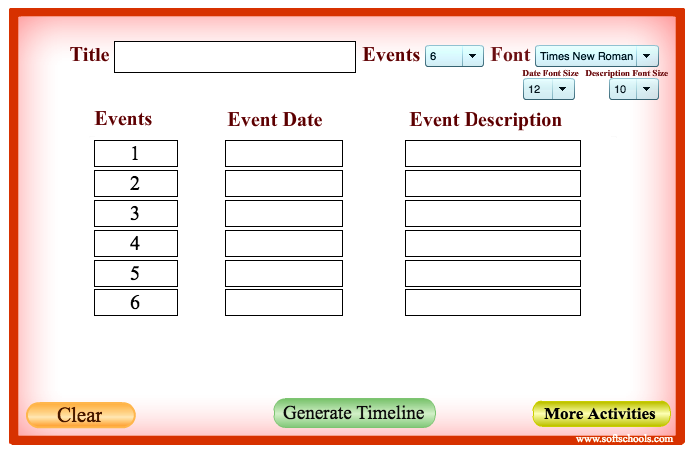 To create a timeline on Timeline Maker, you only need to select the number of events and for each of these events you provide a date and description. Here is how to get started: head over to this page and click on ‘Start’. 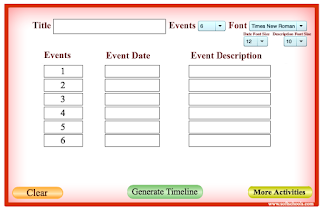 Next, provide a title for your timeline and fill in the info regarding the events you want to include in your timeline. You have the option to include six events. To change the font style of your text click on ‘Font’ on top right hand and select from the 5 options provided there. Once you are done click on ‘Generate Timeline’ and there you go. Your timeline is ready to be printed and shared with others.